I'll be the first to admit that I didn't "get" Twitter. When I first heard about it and saw that "tweets" were 140 character micro-blog posts that contained such mindless drivel as "Heading out to work" or "Getting a haircut" I dismissed it as pointless. A couple of months ago my good friend Jeff told me that I should give Twitter a go. Jeff's a bright guy so I ask him "Why on earth would I want to do that?". His response was "You don't blog frequently enough for me". Well, this was indeed true. As I've been working more and more on my startup I didn't have as much time to devote to blogging. I had lots of things I wanted to share but didn't want to take the time to put together a full blog post for it. So in July of '08 I grabbed a Twitter account and started tweeting away. I only had a couple of "followers" (people that would see my tweets in their Twitter home page) for the first few weeks. They were close friends that were also playing with Twitter for the first time. At that point simply using the interface that Twitter provides on their home page was enough. I'd drop in my 140 character status, catch up with what my friends were doing and that was that. Within any of these columns you can also set a filter to help limit what you actually see in the event your are tapping a tweet source that is very active. You can also mark tweets as read and have them removed from your view if you only want to see what's new. At the top of the All Tweets column is a number that shows you how many unread tweets you have though that's the only place the unread count appears for me on the current 0.20b version. I really enjoy using TweetDeck. Though I would like the user interface to be a lot more compact I can generally see most of what I want on a single screen if I make the window large enough. On my Mac Pro with two 1600x1200 displays I've found that TweetDeck works best with 4 visible columns. Unfortunately you cannot size the columns so on my 1600 pixel wide display I max out at 5 visible columns. I love that it has shortcuts for URLs and pictures when I am creating a tweet and that I can Retweet something I find interesting to my group of followers. I really do wish the text entry area had auto spell checking though; since it's now embedded in virtually every editing surface I have I've become quite accustomed to seeing little red squiggles when a word is misspelled. Getting beyond the UI, the biggest benefit to TweetDeck is that I can create a number of different columns that can track my interests, especially by entering a search term. This is where Twitter stops becoming just a cute little time waster and starts to become a very powerful networking tool. If you have a deep interesting in something just put it in a search column in TweetDeck and see what comes up. If it's an active topic the search window will dynamically update, providing you with an ongoing stream you can dive in to if you see something that catches your fancy. 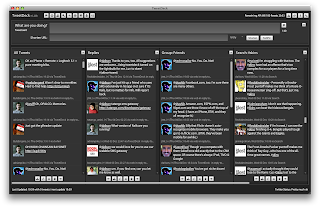 TweetDeck is not perfect but it is by far the best tool I've used for accessing Twitter. If you've got a better tool for accessing Twitter please drop a note in the comments or feel free to follow me on Twitter and shoot me a reply. Hi David, great post. Just wanted to mention that the next release of TweetDeck does have a spell checker and the update of Searches has been debugged and now updates every minute. @Iain: That's great to hear. You've done a really nice job with TweetDeck. I just signed on to Twitter recently and got TweetDeck. However, since I don't use it that much, I find TwitterFox is more appropriate for my needs. I also just started using Facebook, and I have a whole lot more people I know using that. I'm likely to mostly use Facebook for now. I will follow you on Twitter, though. If you have a Facebook presence, I'll add you there, too. @Keleko: I had TwitterFox installed for a while but took it out; didn't work well for me. TweetDeck is really for Twitter junkies, which I am fast becoming. Like your use of Twitter I have a Facebook account but rarely use it. Hopefully you'll see some of the benefits of Twitter though. Now, if I can't find what I'm looking for with Google I'll just post it in Twitter. You don't need a lot of followers to get a response if it's an area where people are interested. Hahaha - my sarcasm apparently didn't translate when I said "you don't blog often enough for me". I said this was back in the day when you spent more time blogging than cutting code LOL. David, I still don't get it. To me Twitter seems like a new way to waste time. Kinda like sitting around the pub talking to your mates all day. Do you have to search back thru all the conversation you've missed? And then set about replying to each relevant one? Or do you just have it at hand all the time - computer, iPhone, wherever - so you never miss a Twit? Of course you're not the sort of bloke to waste time like that, so I wonder if you can explain how Twitter actually helps streamline conversations, coz I just don't understand how it can increase productivity. @Chris Howard: That is an excellent question Chris! Like anything on the web (YouTube, Blogs, Forums, etc) there is a tremendous opportunity to waste time and Twitter is no exception. I've had to become fairly rigorous about how I approach Twitter lest I try to watch the stream of tweets coming in from the people I follow. This is also one of the reasons I have turned TweetDeck notifications off; I like to have TweetDeck collecting my tweets so that I can quickly scan through when I'm ready, but with notifications I felt the need to go and see what people have said all the time. Since tweets are limited to 140 characters the writers of them need to be clear and very succinct; that helps keep things very readable. My personal rule is that if I find someone pumping in tweets that I find uninteresting I simply un-follow them. As of right now I'm following 49 people. Some are friends, many are folks that started following me and I would look to see if they were tweeting information that I would find valuable. To give you an idea of how handy it's been for me, I started tweeting about the development platform I'm building on right now: Ruby on Rails. I'd throw out a tweet on a problem I was having or a question on providers for services and the next thing I know I'm getting replies with recommendations. It's a little like following a forum or mailing list but because the responses are only 140 characters it's much easier to stay on top of. People tend to get right to the point. In addition, I pay more attention to anyone that replies to me and lots of attention to anyone that messages me directly (those are private). These are a couple of the things that make TweetDeck such a great help for people that really like Twitter; you can organize these different views to suit the things you really want to keep track of. Twitter is an evolving technology / platform right now. I find it fascinating because while on the outside it seems trivial once you start to leverage features like Twitter Search you start to see a very dynamic resource for finding information. I hope this helps Chris. Kind of a rambling reply; you should see what it would have looked like in Twitter! Hi David. I'd just like to congratulate you on your blog. I've just finished reading the whole lot, including the comments, in chronological order. I found it via TUAW about a month ago. You and your commenters have certainly increased my Mac knowledge. I'm also a software developer (IBM/Lotus products) and a switcher, or should I say a returner. I did Basic programming on an Apple IIe in high school; I was using SE30's at Uni back in the XT and 286 DOS 3.0 days; my first job after Uni was at an Apple Reseller where I had a IIsi and Newton; I purchased a secondhand LCII in the mid 90's which now sits unloved on the shelves in my garage. Unfortunately the business world is a heavily Windoze install base and that is what I been using for the last 13 years. I purchased my first iPod in September '06 - it's a black 80GB fifth generation - then came an orange 1GB Shuffle in February '07 as I wanted something smaller for when I was out riding my mountain bike. Then came the iPhone in December '07; it is an 8GB first generation, unlocked (needs to be for use in OZ) and jailbroken. I purchased my 17" HighDef MBP and a 1TB Time Capsule back in April once the MBP got its update. They have both been fantastically reliable and do everything I've asked of them - "everything just works!" My vintage '01 PC has now become a server for my development needs, but my IDE is installed in XP under a Fusion VM. I also operate my MBP using similar methods and software applications that you use. A couple of things to mention to you and your fellow readers; I use the Glims plugin for Safari and Fluid as my SSB for GMail. For those that want a small footprint XP installation, I can recommend XPLite. I reduced my Boot Camp OS install down below a couple of gig by removing all the MS crap that I was never going to use when running XP. A 250GB hdd doesn't go far when you have large music and photo libraries so I used Monolingual to remove the PPC binaries and foreign language files. IIRC this gave me back in the order of 7 to 8GB of usable space. Finally, I haven't heard you mention FrontRow. I gather you would have gotten the Apple Remote with a couple of your Mac purchases. For those readers that don't have an Apple Remote you can launch FR with the Command-ESC keystroke. I regularly watch Apple movie trailers and podcasts using FR. For those that love the design of Apple hardware, I can recommend you watch the Jonathan Ive New MacBook movie that shows how it is constructed. It's about 7 minutes in length. @Kermit: Glad to see you found and like the blog; interesting reading through your experiences with Macs. @David said: "Kind of a rambling reply; you should see what it would have looked like in Twitter!" LMAO! Yes, I'd love to see you edit that down to 140 characters! :D Thanks for the chuckle. Also, thanks for the effort you put into replying. I appreciate that and that's one of the reasons why I follow your blog - you make a genuine effort to help people. Re Twitter, I've tried it a couple of days but never got hooked. I think maybe it's because I don't have a need. If I had a interest that I wanted to ask the world about, I would. But it'd have to be work related, coz yes, I could tweet about sport (AFL & cricket), but then I know I'd waste heaps of time! TwitterPod is light weight functional twitter client and I am using this every day. Not sure if you have an iPhone, but Tweetie is a great iPhone app. Well worth the $2.99 IMO. I currently use Twitteriffic on my desktop, but will try TweetDeck. Thanks for the suggestion. @Hiroshi Sumio: Thanks for the link, I'll check it out. @Ken: I've been using Twitterific on my iPhone but I'll check out Tweetie. Thanks for the suggestion.